The purpose of this project is to conduct a hydrologic/hydraulic modeling study for the Millet and Brise Tout ravines. The objective of the study is to develop an evaluation tool to determine flood impacts in the ravines both with and without the installed and planned small rock check dams and therefore assess the effectiveness of the dams. Since there are no historical or real-time representative hydrometeorological data for either ravine, there is no way to quantitatively assess the effectiveness of the many check dams and assess the value of the infrastructure using hydrometeorological observations. Therefore this assessment will need to be done through the application of hydrologic and hydraulic modeling as proposed here. 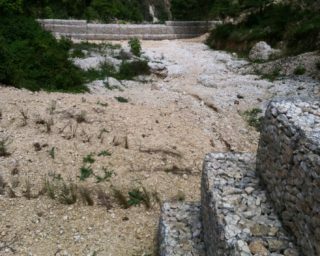 In addition to evaluating the effectiveness of the check dams for the ravines in Haiti, an offshoot of this project is the development of a modeling approach to evaluate the effectiveness of infrastructure-based interventions that is transferrable to other urban watersheds in the world with similar vulnerability to floods and flash floods and with a sparse historical and real-time hydrometeorological data.